Chinese Dog 2015 horoscope predictions foretell that you will be loaded with additional responsibilities in your career and you will form new alliances. This year will be demanding with small achievements. This Chinese zodiac sign will opt for team work during the year in their professions. They will have to fight for their position when it comes to top management decisions. The Dog in 2015 Chinese astrology forecasts show that they will be free and friendly with their contacts. Their friends will seek guidance from them on their problems. Year of the Green Wood Goat will present many opportunities for Dogs to work for social organizations involved in helping the downtrodden people. People born in the Year of the Dog are earnest and devoted to their jobs. They like to work in a peaceful environment and exhibit their professional skills. They are happy working with all types of people. Dogs will achieve sufficient success and recognition in their careers during 2015. If they feel what they think is correct, they have a tendency to be adamant. A little flexibility will help them in going up the ladder. The Dog 2015 horoscope predicts that they have to change their mindset of getting stuck to secure jobs. Look for new jobs or business opportunities in 2015. This will bring in large scale monetary gains. Taking calculative risks can help you save money for the future. Dogs show lot of positivity in matters of love and relationships as per the Dog 2015 predictions. There will be a profusion of romance and passion in their newly found love partnerships. The Dog 2015 Horoscope also predicts that an element of jealousy creeps in the relationship between husband and wife. This may result in irreconcilable differences between them in 2015. Harmony in relationship can be maintained by talking over the matter frankly or resorting to counseling by a professional. Normally Dogs feel secure with their family members in their local surroundings. However year 2015 throws up many chances to explore the outside world. This will not only be relaxing but also will broaden their mental outlook predicts the Chinese Horoscope 2015. 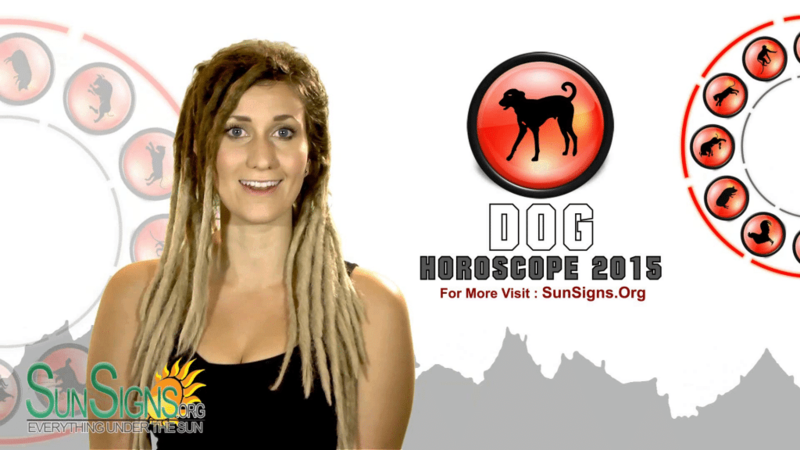 The Dog 2015 Horoscope foretells that this animal sign will be blessed with exceptional health in the Goat Year 2015. Their fitness will improve progressively during the year. Even health problems carried over from the previous year will be cured. Dogs should pay attention towards maintaining their emotional health during the year 2015 by resorting to spiritual healing techniques. The Feng Shui 2015 forecast for the Dogs predicts that you need to control your emotions better. Do not follow blind financial practices or speculation without proper analysis.